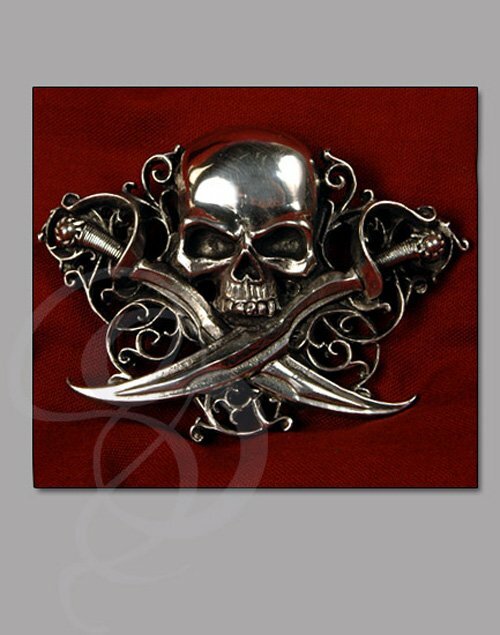 It is no idle claim when we say that this is the coolest belt buckle we've ever seen. There's a reason why half of the Strongblade staff bought this piece as soon as it arrived. It's truly a work of piratical art. Made in England using the finest of English pewters, this belt buckle is crafted to the highest possible quality level. The intricate lacing of metal behind the brooding, angry skull is astonishingly detailed. The two crossed swords aren't just token blades they are carved in every detail and wickedly gnarled and curved. The hilts on the pewter swords are fully realized, with cord wraps and intricate pommels. Did we mention how freakin cool this thing is? The buckle has a metal bracket that will accept most snapping belts and a pewter peg to lock into the holes. 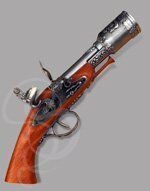 This is absolutely a must have addition to any pirate costume, or just for those who have a cutthroat's heart. Materials: 100% High Quality English Pewter. Dimensions: Approximately 4 inches wide by 3 inches high.